If I have a bowl of pasta with home made vegetable soup poured over it, does the soup count as speed food. The soup was made from broccoli,cauliflower, onion and veg stock cube and spices. This was a lazy tea but filled me up rather nicely. It absolutely does! Similarly, I make a "hide the vegetables" sauce which is basically passata with LOADS of frozen veg chucked in, simmered for a bit, and then blended up. I even use this sauce as a base for chili con carne now and it adds a lot. As long as you make the soup by using speed food, then it's a speed food. Soup is a great meal though, especially when using plenty of speed foods! Just a note, and not everyone takes note of them, but for me I avoid them. 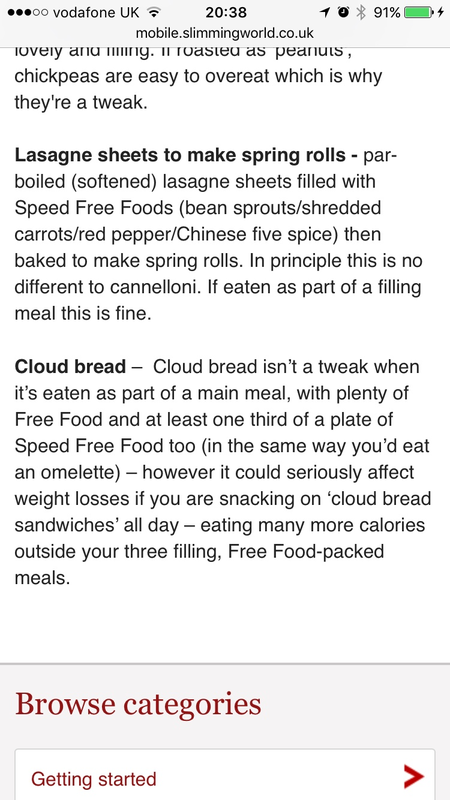 Cloud bread can be classed as a tweak when it's not eaten as part of a meal. Because it isn't made from and doesn't contain speed food, it can be easy to overeat. Like I said, not many people take note of tweaks, but I do try to avoid them. Find more posts on food, soup, speed.